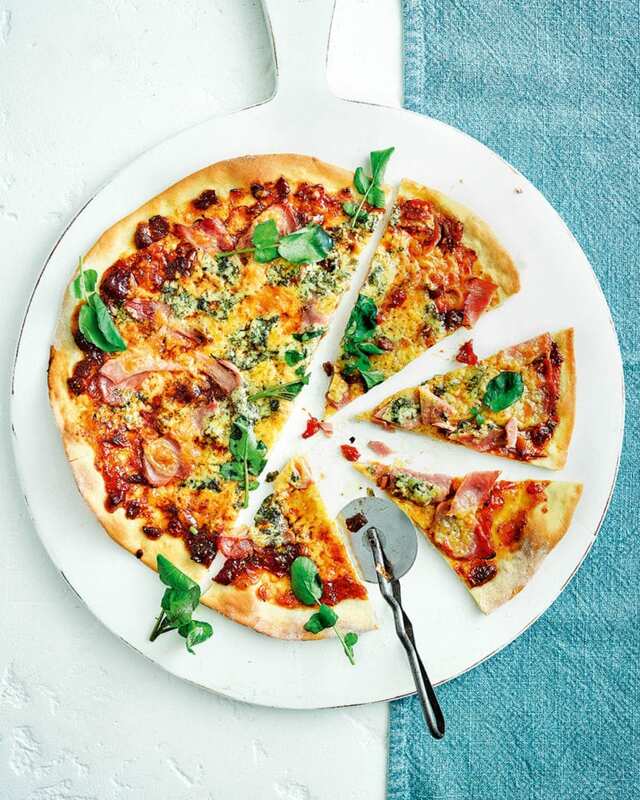 Use up leftover ham and cheese in our ploughman’s pizza for an easy meal using ready-to-roll pizza dough. Heat the oven to 240°C/220°C fan/gas 9 (or the highest setting). Put the dough in the centre of 2 large sheets of non-stick baking paper, roll out into a disc roughly 30cm in diameter, then transfer to a sturdy baking sheet (see tip). Dot the chutney over the pizza base, leaving a 3cm crust. Scatter with the cheese and ham, then bake for 10-15 minutes until golden and bubbling. Serve topped with the watercress. To prepare the pizza base without baking paper, dust the work surface and a rolling pin with plain flour, then lightly dust the baking sheet with a little extra flour to stop the dough from sticking.